The speed and exhilaration of multihull sailing comes with a price. When it goes wrong and a big multi capsizes, it stays capsized and generally you’ll lose the rig. 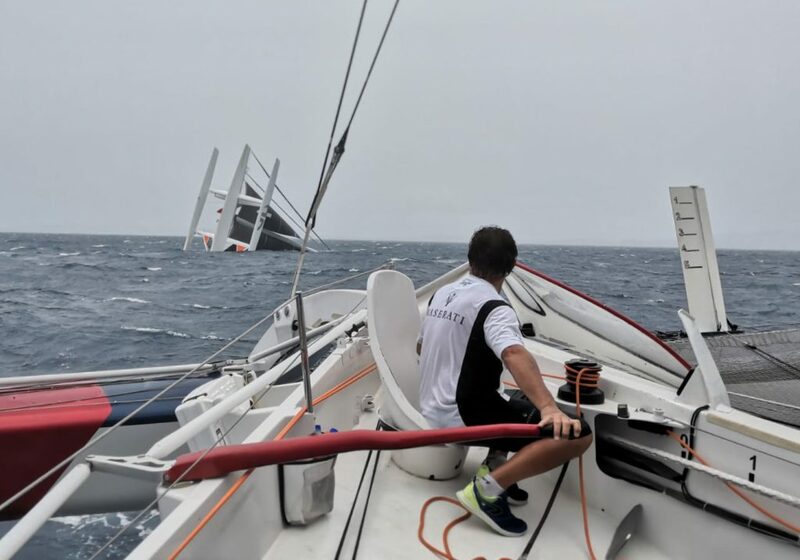 On Jason Carroll’s MOD 70 Argo (Larchmont, NY) we found ourselves in this unfortunate position just before the start of the Royal Ocean Racing Club’s 2019 Caribbean 600. Team Argo made an amazing rebound from this incident to start and finish the Caribbean 600! Things were pretty rosy for Team Argo after blitzing the Pineapple Cup record and enjoying a nice, easy delivery from Montego Bay to Antigua. Our first couple training days before the 600 went well and we were loving having Francois Gabart onboard. We squared off with the other MOD in the 600, Maserati, in the Around Antigua Race the Friday prior to the Monday start, and were leading by a few miles. With just 10 miles to go, we’d furled the gennaker and were reaching along at a 110-degree true wind angle in around 20 knots. This is a very fast angle for the MOD, and boatspeed was in the mid-30s. Fast, but also unstable and we were preparing to reef the main when a big, lifting gust hit us. The boat, which had been sailing fairly flat fore/aft, went into a nosedive and immediately pitchpoled. In this situation, easing the big square-top mainsail just pushes the bow down and certainly contributed to the capsize. We immediately knew the boat would not recover and went into self-preservation mode. Before the boat went all the way, a couple of the guys made it inside while the rest clung to lines aft of the boat while it found its final orientation. At that point, the crew got into the hull through the escape hatches and called for help. Quite the odd sensation being inside the boat as it had a vertical orientation with the stern in the water. Someone mentioned it felt like being in a Saturn V rocket ready for takeoff! Since we were only in 18 meters of water and Argo has a 28-meter mast, she settled with the mast tip on the bottom and became somewhat stable. This allowed us to wait for the towboat and rescue divers, still believing we could save the mast. Once on scene, the diver attached an airbag to the rig and the towboat began to slowly pull the boat upright by two lines affixed to the forward beam. This was a masterful and quite lucky rescue, aided by the shallow water and the fact that the boat shipped quite a bit of water in the stern, which made the whole platform stable. Argo became the first large racing multihull in history to be righted with the rig intact. She was towed back to her slip in Falmouth Harbor and the real work began. Once the PTSD wore off, we decided to try and fix things to the point where we could race. The massive job list included pulling the rig for repairs, replacing most of the electronics, rebuilding the engine, and getting the sails repaired. We had 48 hours. Amazingly, everything went our way and by the morning of the race the rig was back in and we were making final preparations. In a gracious gesture by both the RORC and Maserati, we were granted a delayed start and proceedings began at 14:00 on Presidents Day. We soon learned that staying up for most of the last two days had left little in the tank for actual racing. Trepidation and fatigue stalked us and we worked our way through the first few legs. Maserati eased out to a 5-mile lead and we just tried to keep pressure on while maintaining a cadence that would allow us to finish. The long reach to Guadeloupe is always a high-speed treat, as is the reach across the eastern edge of Antigua toward the finish. We dared to dream as we closed to within one mile of Maserati at the Redonda mark, where we turned for the final 33-mile beat to the finish. A pretty intense match race ensued but they sailed very well, covering at all the right times and beating us home by less than seven minutes. Both boats handily beat the previous outright race record, and we finished ahead of Maserati when handicaps were applied (Maserati sails in foiling configuration while Argo’s a “lowrider,” thus the handicap delta). Chad Corning is a professional sailor, program manager, build manager and coach.